If you read the recent article on the most common travel diseases, you already know that I’ve got a vested interest in learning about all of these uncomfortable, more-common-than-you-think viruses, bacteria, and parasites that call our favorite vacation destinations home. Why? Because, as a frequent traveler and Oyster Investigator, as often as I’ve beaten the odds, taken the precautions (or not), and escaped with nothing more serious than a weird shorts tan, my luck finally ran out. On my last trip, I brought something home with me. During the last two weeks of my trip, I carried around a fever along with mild aches and pains. I brushed it off, thinking it would go away once I was able to get home, into my own bed, and have a few good days of rest. Wrong. My symptoms got worse; I developed a rash, my daily fever got higher and lasted longer, and I was pretty much quarantined to my bed, severely uncomfortable and incredibly bored. After a week no improvement, I called the triage nurse and explained my symptoms, noting that I’d recently been to South Asia; I was told to immediately seek medical attention. Three days, a doctor, a specialist, and 15 vials of blood later, there was nothing to do but wait. So, I did a lot of searching. Internet searching. Summer in New York City is H-O-T, and I didn’t know how much longer I could stand having an almost constant temperature of over 100 degrees Fahrenheit, let alone the “everything hurts” accompanying uncomfortable-ness. Things could have been much worse—a friend I spoke to said a coworker of hers had contracted the trifecta: malaria, dengue, and chikungunya during her travels in South Asia—but I wish I had been more vigilant. In fact, I wish I’d read this article before I left (though, at the time, it did not exist), and maybe it would have made a difference. It pays to know what you’re up against. Here are five untreatable diseases that are easier-than-you-think to pick up while traveling. But it’s not all doom and gloom. We’ve also included how you can try to avoid them. According the CDC website, over 400 million people a year contract dengue fever, making it the number one infectious disease and cause of death in tropic and sub-tropic areas. In fact, the World Health Organization estimates that nearly half of the world’s population is at risk. Like so many of the diseases that pose threat to travelers, dengue fever is spread by blood-sucking mosquitos. However, unlike many of these diseases, which tend to be found in villages or more rural areas, dengue is most common in urban and suburban spots. For example, the island of Sri Lanka has reported nearly 20,000 cases already this year, all mostly concentrated in the capital city of Colombo. While practically all U.S. cases are acquired abroad, Guam, Puerto Rico, and the U.S. Virgin Islands can claim dengue as endemic. Endemic, high-risk tourist destinations include mosquito-loving spots like the Caribbean, Latin America, Pacific islands, Southeast Asia, India, and sub-Saharn Africa—although two endemic cases were just reported in France. In addition to malaria-like symptoms of aches, fever, joint pain, and rash, this uncomfortable disease can become quite severe, causing hemorrhaging, shock, and sometimes death. The worst bit is, there’s no vaccine and no treatment—you’ve just got to try to not get bit by mosquitoes, particularly the ones with white stripes Aedes aegpyti. Get your DEET repellent on, cover your arms and legs with sleeves and pants, stay in accommodations with air-conditioning and mosquito nets over the beds, and try not to scratch bites if you get bitten. If you are unlucky and contract this unwanted souvenir, seek medical attention immediately, as beginning supportive care as early as possible can help ease discomfort. You should avoid anything that thins your blood, like aspirin and alcohol. Tuberculosis has been around since the late 1880s, infecting us through the air we breathe and direct person-to-person contact. Also known as consumption and the white plague, this bacterial infection was killing about one in seven in the overall population of the US and Europe when it first reared its deadly head. With modern advances in medicine and a slew of new diseases to worry about, TB may seem like a disease of the past (hey, so did the plague), but it’s actually the second most deadly infectious disease on the planet, killing millions of people each year, mostly in poor areas where there’s a lack of medical support. Highest risk areas are those with rampant TB rates and drug-resistant strains of the bacteria, like in India, Russia, Sub-Saharan Africa, and parts of Asia. Since this disease is airborne, you are most at risk for infection if you have spent time in close proximity (think: on a plane) with someone who is either actively suffering from TB or is even just a latent carrier. Some symptoms include cough (possibly with blood or mucus) that lasts a few weeks, fever, night sweats, and weight loss—though it can also affect other organs, each with their own symptoms. There is a vaccine for TB, though we don’t tend to use it much in the United States; it’s more widely jabbed out in higher-risk countries. And while there is technically treatment—that can last between six to 12 months—for the disease, more and more strains of the bacteria have become multi-drug resistant, causing infection and fatality numbers to rise. So to avoid it, you might just want to avoid any areas where there is a current or recent outbreak. Watch what you eat! But this time it’s not for your figure, but for your liver. Hepatitis A, an inflammatory liver disease, may not be common in the United States or other westernized countries, but it can be a serious threat in lesser developed countries with unclean drinking water and/or poor food sanitation standards. For example, while investigating some hotels in Tulum for Oyster this year, I returned home only to learn there was a Hepatitis A outbreak during my trip. I immediately regretted the pounds of ceviche I consumed and questioned my stops at an off-road snack cart, where I grabbed a quick bite on more than one occasion. (Don’t worry, I returned unscathed.) You can also snag this party favor after engaging in unprotected sexual activities with an infected person. Symptoms can include low-grade fever, nausea and vomiting, abdominal pain (particularly around where your liver lies), joint pain, and jaundice. Now, for the good news! Although there is no treatment for Hepatitis A, you can get vaccinated if you are traveling to a high-risk area. But even if your luck falls on the bad side of the coin, nearly every case ends in full recovery—plus you’ll walk away with some future Hep A fighting antibodies, to boot. Otherwise, do your best to avoid it by vigilantly washing your hands, perhaps carrying around antibacterial sanitizer, and avoiding risky foods like raw meats and fish, questionable water and ice, and food joints that may not be up to code. Up until a few years ago, the Americas happened to avoid reported cases of this oft-debilitating virus, that induces mostly crippling joint pain and fever—sometimes with an unfriendly side order of headache, muscle pain, rash, and/or joint swelling. However, all that changed in late 2013 when travelers to the Caribbean started to become infected, though it still remained relatively unknown until late 2014. While on holiday to Bora Bora, actress Lindsay Lohan came down with chikungunya and the news went wild with her “rare and incurable disease.” Unfortunately, the hordes of travelers to infected paradise islands have brought back infected blood to over 44 countries in the Americas, including several U.S. states. 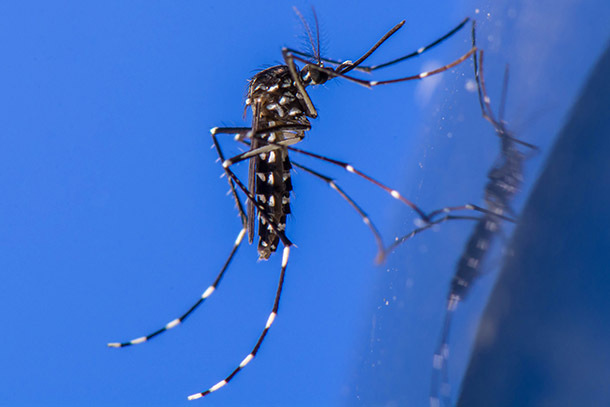 Since the only way to get this funky-named virus is through already-annoying mosquito bites (the ones that carry chikungunya tend to bite during the daytime), the best way to avoid it is by (yeah, we know—easier said than done) avoiding being bitten. Slather up on the insect repellant, wear long-sleeved shirts, and wish for the best. There’s no treatment, meaning if you are unlucky, expect to be laid up in bed for a few weeks to months until the virus has run its course. If you haven’t figured it out yet, the life purpose (it seems) of a mosquito is to pass along disease to unsuspecting victims. Yellow Fever is yet another unwelcome gift from the stripy, bloodsucking Aedes aegypti species. Discovered in the 1500s, this hemorrhagic fever can have mild to severe symptoms, from fever and sensitivity to light to jaundice or abnormal bleeding, and even results in death in 20 to 50 percent of all serious infections. While highest risk areas are in Central and South America and Africa, the disease is considered so dangerous that currently 159 countries require proof of vaccination if you are coming from an at-risk area. The vaccine for YF is a live (but weakened) version of the virus and is known to cause a few mild side effects, from fever to aches, in about 25 percent of those jabbed—and some severe, potentially deadly, side effects from nervous system reactions to organ failure in about one out of 125,000 to 250,000. The vaccine is good for 10 years (longer in some countries), but if it’s not a requirement, you may want or need to skip it in favor of CDC-recommended prevention methods of strong DEET-ingredient insect repellant, covering up and wearing protective clothing, and avoiding peak mosquito biting hours. This article was originally published by Oyster.com under the headline Untreatable Diseases You Can Easily Pick Up While Traveling (And How To Avoid Them). It is reprinted here with permission.